Which game would you take to a desert island? These are our picks for a Castaway situation. Now tell us yours. Welcome back to the PC Gamer Q&A! Every Saturday, we ask our panel of PC Gamer writers a question about PC gaming. Tim's answer is usually 'Hearthstone'. This week: which game would you take to a desert island? Shout out to the enjoyable podcast Final Games, which asks this very question to guests every episode (which have included PCG's Andy Kelly and Samuel Roberts in the past), allowing them to pick six games. Here, though, we've just limited the selection to one game. As ever, we'd love to hear your suggestions in the comments, too. I've resisted the temptation to draw Samuel's ire by answering Hearthstone again, but I am going to assume the island has a working internet connection and pick The Orange Box. Between the infinite replayability, the sheer joy of Portal, and the no small matter of Episodes 1 and 2, I'm pretty sure I win on pure value. Game? How about software? Depending on how ambitious I'm feeling, I'd take either Unity Engine or Game Maker Studio. Then, as I basked in the sun waiting for rescue for the next several years, I could finally see about getting around to building my magnum opus. And let's assume I have all the necessary tools for doing graphics, sound, etc. and that infinite power is available. The game would be something cyberpunk, but the great thing about having a software development platform is that I wouldn't need to create just one game. I could dabble in all sorts of genres and make as many games as I wanted—or at least, as many as I had time to create before I was rescued, brought back to humanity, and became an instant millionaire with my wildly successful first indie release. Don't pinch me, I'm enjoying my dreams. 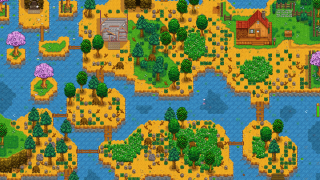 Is it weird to bring a game about growing food to an island where I'll be growing food to survive? Stardew Valley could be useful, reminding me when it's a good time to plant turnips or whatever. Plus, since I assume there's no wi-fi on this island, I'd be able to experience it properly. I came to Stardew Valley late so there was already a wiki full of advice on what gifts to give people and where they hang out at any time of day, which spoiled it a bit for me. I never had that experience of waiting outside somebody's door all day just to give them a fish they'd asked for. Mostly I'd bring Stardew Valley because it would make me less lonely. That virtual village of people would be better substitute friends than a ball with a face on it. Spending time with them makes me genuinely happy. Just filling my dog's bowl, harvesting some crops and walking into town to check in with people lifts my spirits, straight-up sunshine injected into my heart. The only other game that improves my mood as surely as Stardew Valley is Blood Bowl, a game about football and murder, but let's gloss over that. If I'm trapped on a desert island, escapism is going to be important. So I'd take The Witcher 3 and all the DLC. That's a game you can get lost in, and it's so impossibly huge that by the time I've finished it I'll have forgotten most of it, making it feel fresh when I start all over again. And when I've absolutely exhausted the storyline and know every quest by heart, I can just focus on getting really good at Gwent. Maybe set myself a goal like beating every single Gwent-playing NPC in the Northern Kingdoms or collecting every card. That should rinse through a few years. I'm just going to be honest: the only way I'd ever complete a Hell run in Spelunky is if I was trapped on a desert island with nothing to do but play Spelunky. Instead of telling you again why it's incredible, I'll just refer you to its #10 ranking on this year's Top 100, and its well-deserved Game of the Year 2013 award. Really, even in casual dabblings with CK2, there's always something interesting happening, some curious and enjoyable little stories bubbling to the surface, some random events throwing a medieval wrench into the works, some massive battle or minor yet incredibly personal beef occupying your attention. Every session of CK2 feels completely different, even with the same starting country and scenario. If I can bring some of the full conversion mods along too, I'll never be wanting for great new stories and long-lasting memories. And I play for a few years solid with no interruptions, maybe one day I'll be so on top of things that my character won't be over their demesne limit. I was having trouble with this one until Wes answered Spelunky. Which reminded me that, despite countless runs, I've never actually reached the bottom of Dungeons of Dredmor and killed Dredmor himself. A trip to a desert island would give me time to finish things once and for all. Plus if I can finagle mod support, or at least download the DLC, I may still never see everything the dungeon has to offer. I'm half-tempted to pick an MMO I've never had time for, like The Old Republic or Guild Wars 2, but if I'm being honest with myself, MGS5 is the one. Missions play out differently each time, and the more hours you invest, the more tools you unlock to mess around with the enemies and their surrounding environment. Reaching S-rank on every mission would consume plenty of time, and while island life would be lonely, I could always pat D-Dog if it all gets a bit much. But what about you, kind reader? Let us know below.